APNU Member of Parliament, Joseph Harmon. [www.inewsguyana.com] – A Partnership for National Unity (APNU) has called for Head of the National Industrial Commercial Investment Limited (NICIL) Winston Brassington to be interdicted from all state boards and entities. The APNU continues to insist that there is a lack of transparency in the construction of the controversial Marriott Hotel, which is being partly funded by NICIL using state funds. The APNU believes there is undoubtedly an intent to hoodwink the nation. Government had said in the past that it has a right to negotiate national projects in private. However, Harmon said this is in total contempt for Guyanese. “Disclosure is yet to be made of the investors, their profile, source of funds, amount offered, payment terms and other arrangement,” he added. The APNU Parliamentarian said that with Brassington at the center of such deals, it is incumbent on President Donald Ramotar and his administration to carry out the forensic audit of NICIL demanded by the Parliament. 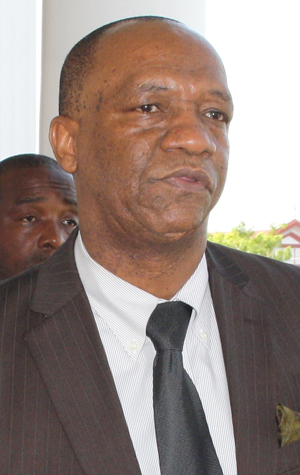 “All investors including any banks are now put on notice that the APNU consider this project to be lacking economic justification, without parliamentary approval and as presently configured not in the best interest of Guyanese,” the APNU said. The party had previously accused the President and by extension the Government of protecting Brassington and today dispelled all assertions that it is has launched a personal attack on him. “Brassington is a person of public interest and as such he deserves some amount of interdiction,” Harmon noted. He said the APNU will continue to take steps in the National Assembly to ensure greater accountability and transparency of national projects.